Newmarket Press. Paperback. GOOD. Spine creases, wear to binding and pages from reading. May contain limited notes, underlining or highlighting that does affect the text. Possible ex library copy, thatâll have the markings and stickers associated from the library. Accessories such as CD, codes, toys, may not be included. HarperCollins Publishers, 2001. Paperback. Good. Disclaimer:A copy that has been read, but remains in clean condition. All pages are intact, and the cover is intact. The spine may show signs of wear. Pages can include limited notes and highlighting, and the copy can include previous owner inscriptions. At ThriftBooks, our motto is: Read More, Spend Less.Dust jacket quality is not guaranteed. HarperCollins Publishers, 2001. Paperback. Very Good. Disclaimer:A copy that has been read, but remains in excellent condition. Pages are intact and are not marred by notes or highlighting, but may contain a neat previous owner name. The spine remains undamaged. The dust jacket is missing. At ThriftBooks, our motto is: Read More, Spend Less. HarperCollins Publishers, 2001. Paperback. Acceptable. Disclaimer:A readable copy. All pages are intact, and the cover is intact. Pages can include considerable notes-in pen or highlighter-but the notes cannot obscure the text. At ThriftBooks, our motto is: Read More, Spend Less.Dust jacket quality is not guaranteed. Newmarket Press. Used - Good. All orders guaranteed and ship within 24 hours. Your purchase supports More Than Words, a nonprofit job training program for youth, empowering youth to take charge of their lives by taking charge of a business. Newmarket Press. PAPERBACK. 1557044783 Very Good Condition. Five star seller - Buy with confidence! . Very Good. Newmarket Press. Used - Good. Former Library book. Shows some signs of wear, and may have some markings on the inside. Newmarket Press. Used - Very Good. Ships from Reno, NV. Former Library book. Great condition for a used book! Minimal wear. 100% Money Back Guarantee. Shipped to over one million happy customers. Your purchase benefits world literacy! Newmarket Press, 2001-01. Paperback. Good. Newmarket Press. PAPERBACK. 1557044783 Gaghan, Stephen. 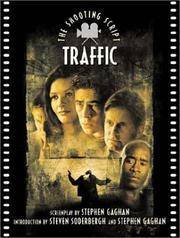 Traffic: The Shooting Script. Soderbergh, Steven. NY: Newmarket Press, 2000. 173pp. Illustrated. 8vo. Paperback. Book condition: Very good with light rubbing at extremities and very small abrasion in top corner of front cover along with slight creasing down middle of front cover. . Very Good. 2000. Newmarket Press, 2001-01. Paperback. Like New. Book has wear from storage and use; otherwise the book is in very good condition. Scranton, Pennsylvania, U.S.A.: Newmarket Pr, 2001. Soft cover. New. Foo. NEW Book, perfect condition, cover/text completely pristine. No physical flaws. FREE TRACKING within the US, and email notice when shipped. Normally, books are shipped twice a day, with afternoon USPS pickup, or next morning drop-off at the Post Office. We package on Sunday for shipment first thing Monday morning. Your satisfaction guaranteed. We have multiple copies of most books. Email inquiries are welcomed. Thanks for reading all of our boilerplate. Newmarket Press, 2001-01-05. Paperback. Used:Good. Newmarket Press. PAPERBACK. 1557044783 Like New Condition. . Fine. Newmarket Press. PAPERBACK. 1557044783 New Condition. . New. Scranton, Pennsylvania, U.S.A.: Newmarket Pr, 2001. Trade Paperback. First Edition. Signed by Author. A trade-size paperback original. SIGNED by screenwriter Stephen Gaghan & by the film's director & author of the introduction Steven Soderbergh. Fine i n pictorial printed wrappers. Signed by Author(s). FIRST. Soft Cover. Fine. Book.